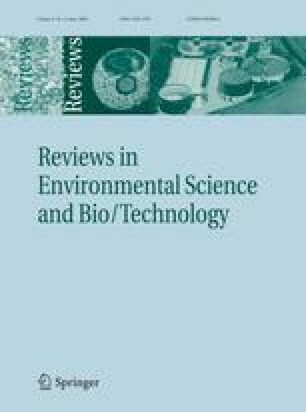 Biological methods of hydrogen production are preferable to chemical methods because of the possibility to use sunlight, CO2 and organic wastes as substrates for environmentally benign conversions, under moderate conditions. By combining different microorganisms with different capabilities, the individual strengths of each may be exploited and their weaknesses overcome. Mechanisms of bio-hydrogen production are described and strategies for their integration are discussed. Dual systems can be divided broadly into wholly light-driven systems (with microalgae/cyanobacteria as the 1st stage) and partially light-driven systems (with a dark, fermentative initial reaction). Review and evaluation of published data suggests that the latter type of system holds greater promise for industrial application. This is because the calculated land area required for a wholly light-driven dual system would be too large for either centralised (macro-) or decentralised (micro-) energy generation. The potential contribution to the hydrogen economy of partially light-driven dual systems is overviewed alongside that of other bio-fuels such as bio-methane and bio-ethanol. We acknowledge the financial support of the Biotechnology and Biological Sciences Research Council (Grant no. BB/C516128/1 and studentship no. 10703 to MDR), Engineering and Physical Sciences Research Council (Grant no. EP/E03488/1) and Department of Environment, Food and Rural Affairs (Contract no. NTFUN2). LEM was supported by a BBSRC/Royal Society Industrial Fellowship in partnership with C-Tech Innovation Ltd.